What Could Have Caused That Major Pipeline Explosion in West Virginia? Filed to: BOOM!Filed to: BOOM! 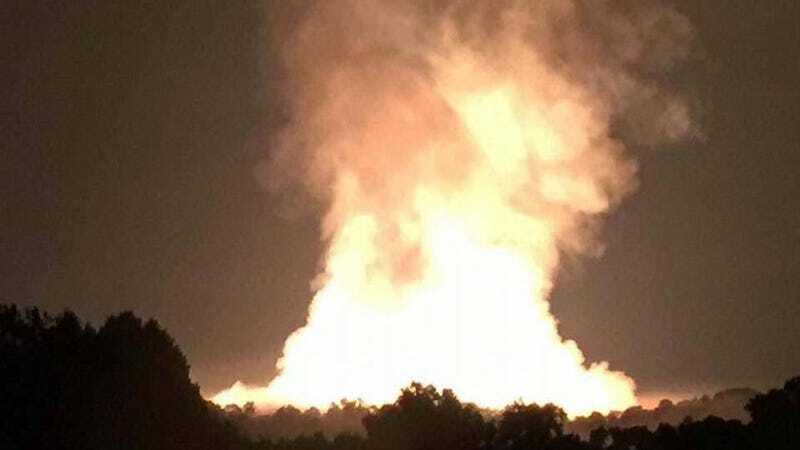 The Nixon Ridge Pipeline in West Virginia exploded spectacularly Thursday, creating a fireball visible for miles. While TransCanada is still investigating why exactly this brand new, “best-in-class” pipeline blew up, we can offer some informed speculation. After all, this is not the first natural gas pipeline to explode. All it takes for a pipeline to go boom is fuel, oxygen, and an ignition source. Lucky for TransCanada, this recent explosion happened in a remote part of Moundsville, hurting no one. In 2010, a Pacific Gas & Energy-owned pipeline in San Bruno, California, exploded, killing eight people and destroying an entire neighborhood. The pipeline system in which the Nixon Ridge line sits, Leach Xpress, runs 160 miles through Ohio and northwestern West Virginia. It can move 1.5 billion cubic feet of gas a day. While we don’t quite know yet what went happened that caused part of the line to explode, it’s not hard to guess. The common factor in just about any gas pipeline explosion is a leak, explained Najmedin Meshkati, an environmental engineering professor at the University of Southern California who’s investigated previous pipeline explosions. “The leak and the gas provide the fuel for you that should not have been there if the pipeline integrity was there,” Meshkati told Earther. With a little lightning or even static electricity from the pipeline rubbing on soil, a leak can become an explosion. Sometimes, the leak can result from pipeline corrosion, which can occur due to old age or a chemical reaction inside the pipeline. “The corrosion eats the body of a pipeline... and when it gets eaten, the pipeline metal gets thinner and thinner, so it gets weaker,” Meshtaki said. That’s one way a pipeline may explode. But this TransCanada line is just six months old, so it’s unclear how likely corrosion’s at fault. In fact, it might not have been entirely the company’s fault at all. During any type of construction, people could be unknowingly digging or drilling where there’s pipeline underneath. This could also create a leak. The thing is, though, these leaks become explosions when they go undetected. A company’s safety culture is really what’s key, Meshkati said. Did the company create a risk assessment for the project? How often was the company checking the line for corrosion? What’re the consequences for a pipeline operator who wrongly suspects a leak and shuts down a pipeline in response? Earther has asked TransCanada these very questions and will update this post if we hear back. In the case of the San Bruno explosion, the California Public Utility Commission concluded in 2015 that the company’s culture prioritized “profits over safety,” putting people’s lives at risk. We’ll have to wait and what lessons come out of this TransCanada explosion.